Over the past five years, Myanmar has come a long, long way. Plagued by civil wars and human rights atrocities for as long as most natives can remember, the country formerly known as Burma has experienced untold hardships for decades. But 2011 saw the military junta finally dissolve and, since then, there has been a slow emergence from the dark days of yore, especially with the first civilian president, Htin Kyaw, being democratically elected earlier this year, opening Myanmar up to the world. And that means the tourist industry has been rapidly growing in the past couple of years as visitors clamour to see this incredibly beautiful land. 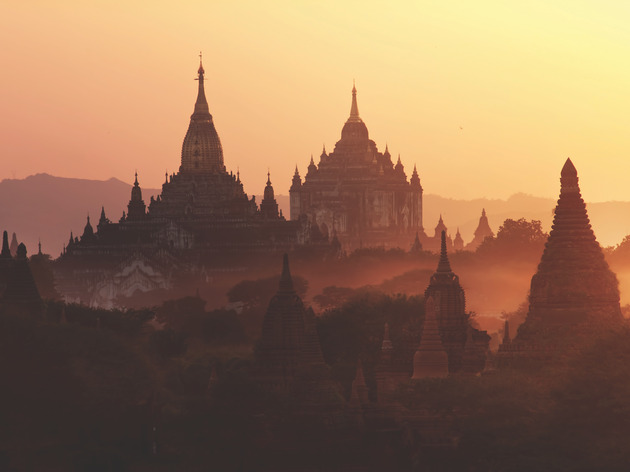 Myanmar’s ancient city of Bagan is Southeast Asia’s oft overlooked temple hotspot, boasting Buddhist pagodas and monasteries that once stood 10,000 strong. The total now sits at around 2,200 due to years of war, decay and earthquakes. But these most definitely need to be seen. And the phrase ‘get there before the tourists ruin it’ rings true, so we recommend travelling to Bagan out of peak season, which basically means heading there in the rainy months between late May and early October. However, bear in mind that because Myanmar’s tourism industry is nascent, it does have its pros and cons. The cons are that it’s pretty pricy due to the lack of competition and, although getting around isn’t exactly difficult, it is tougher than, say, neighbouring countries like Thailand. But the positives far outweigh the negatives when visiting somewhere so incomparably otherworldly. So, off we go on our journey to take in a pagoda or two... thousand. We connect with travel website go-myanmar.com for our trip. They help us plan our itinerary, book our hotel and organise our flights, which we take into Mandalay International Airport. We also hire a car and a driver with the team’s help ($2,700 for three days) and travel three hours alongside the Ayeyarwady River to Bagan. And, as our car enters the ancient city, it’s clear we’re never going to run out of pagodas to explore. On paper, 2,200 doesn’t look that much. But when you see all of them in their mystical glory, silhouetted against the hazy sky, it seems like they go on forever. There are many transport options to choose from when exploring the pagodas, from bicycles and electric scooters to cars and even hot air balloons, but as we’re visiting during the rainy season, we prefer the luxury of an air-conditioned car and the ability to explore further-flung temples. Sunrise and sunset over the temples is a ‘must do’ in Bagan. The swirling pastel palette rising and falling over the pagodas transports us, if just for a few fleeting moments, worlds away from our hardworking Hong Kong lives. It’s definitely an experience incomparable to the heaving sunrise tourist mobs at Cambodia’s Angkor Wat. 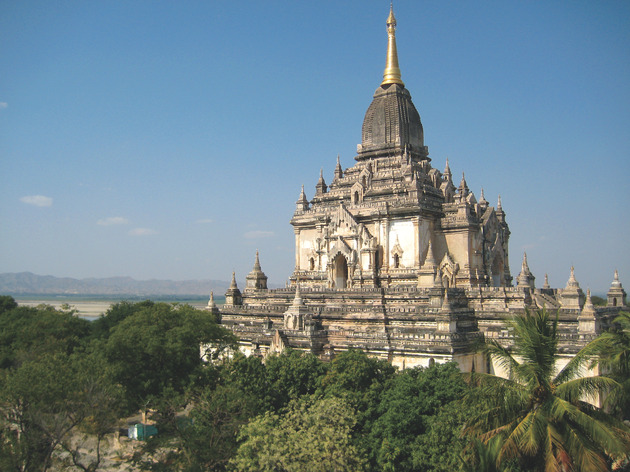 When it comes to the best places for sun spotting, steer well clear of the popular Shwesandaw Pagoda (Old Bagan). Though it’s fantastic in its own right, offering sweeping views that make us wish our eyes had a panorama mode to take it all in, visit it during the day to avoid the throngs at dawn and dusk. For sunset, we drive far away and end up at a small temple overlooking the golden Dhammayazika Pagoda (Pwasaw). Though it’s not as high as Shwesandaw, not having to share this space with anyone else makes it well worth it. It’s hard not to feel like Lara Croft when scrambling up and down these beautiful ancient structures, which can be a little unnerving at times, given the narrow stairs and ledges (don’t worry, you are allowed to climb up some of the pagodas that have stairs). We just have to remember to remove our shoes and dress modestly. We are driven around the plains of Bagan, checking out awesome sites when we spot them. We don’t plan our route and just enjoy the freedom of impromptu exploration, though if you’re more inclined, you can plan which pagodas to visit using a map or tour guide. A particular standout, partly thanks to it being Bagan’s tallest pagoda, is Thatbyinnyu (Old Bagan). This colossal structure is a looming tower, both awe-inspiring and ominous thanks to its size and almost gothic exterior. Although it would take an age to truly explore all of the pagodas, we find that two days is sufficient and next head to Mount Popa (Mount Popa National Park, Pegu Range), some 30 miles southeast of Bagan. Piercing the horizon, this cylindrical volcanic plug boasts the Taungkalat monastery on its summit that wouldn’t be out of place in a Studio Ghibli film. We climb the 777 steps, dodging macaque monkeys (pro tip: don’t bring snacks that might attract roving eyes and paws) to explore the monastery and are rewarded with sweeping views over verdant Myanmar. To catch Mount Popa from afar, we detour to a lookout point (Byat Ta Pan Sat Rd). This area has an unnerving atmosphere, owing to the gaudy, somewhat sinister Buddha statues, abandoned buildings and lack of other people nearby. On the drive back, look out for random green and gold arches which are worth photographing in their own right and also give way to viewpoints where you can snap Mount Popa from afar, as well as see some unusual statues. 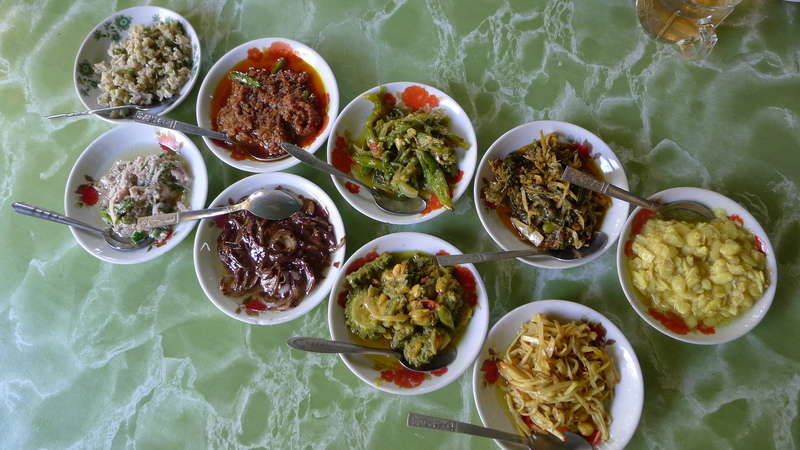 Bagan’s local food is intense and pungent, which may not appeal to all, so plan in advance when eating out. Oddly named veggie joint Be Kind To Animals The Moon (Off Bagan-Nyaung U Rd, between Tharabar Gate and Ananda Temple, Bagan, +95 9 420 709 847) is fantastic and we enjoy its Thai-style curries, stir-fried noodles and tea leaf salad, a crunchy, tangy Burmese speciality. Sanon (Pyu Saw Hti St, Nyaung-U, Bagan, +95 9 451 951 950; tree-alliance.org) is part of Tree Restaurants, a charity organisation that has eateries all over Southeast Asia that help train underprivileged youths. 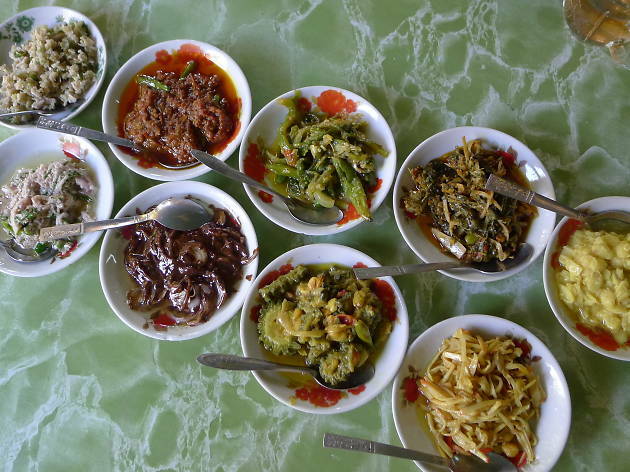 Head here for some brill Burmese classics and to help the community. Bagan’s nightlife is almost non-existent but Ostello Bello (Kayay St, New Bagan, +95 9 257 039 009; ostellobello.com), as well as being a fab hostel, is great for a tasty tipple or two. 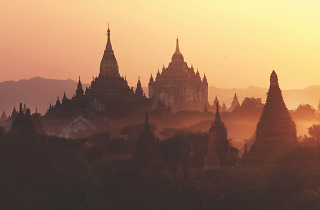 Myanmar’s star is most certainly ascending and with Bagan being one of the last remaining frontiers of authentic Southeast Asian tourism, it’s more worthy of the attention (and much quieter) than the temple sites in neighbouring countries. If you like seeing countless pagodas you will love this incredible city, where, off-season, the tourists are few and the experiences are many. But it won’t stay this way forever, so we can only advise you get there before the holidaying rabbles ruin it!